This Apple Pie Ice Cream Sundae is made with slow cooked applesauce and tastes like apple pie à la mode. Makes a great after school snack! Apple Pie Flavors without all the Work! The other day I found myself with some apples that I needed to use quickly. They had come from my CSA and they weren’t very pretty. Bruises and bug bites dotted the skin. But I knew I could peel them and cut off the bad parts. I noticed that I still had some vanilla ice cream in the freezer. An apple pie sounded perfect, but I don’t do crusts and didn’t have any frozen crusts, and even with frozen crusts it sounded like more work than I wanted to do. I was busy editing photos and I needed an apple dessert that basically made itself. Enter Apple Pie Sundae. This is really nothing more than a slow cooker applesauce spooned over some vanilla ice cream and topped with crush graham crackers. So crazy easy and yet we both loved it. It tasted like an apple pie à la mode, without any of the work! I also happened to have about 4 small pears that I needed to use so I peeled and diced them and included them with the apples. Technically this should be called apple pear pie sundae, but that doesn’t quite have the same ring, does it? Add to Slow Cooker or Crockpot with cinnamon, salt and water and cook for 6-8 hours. Use an immersion blender to get desired consistency. 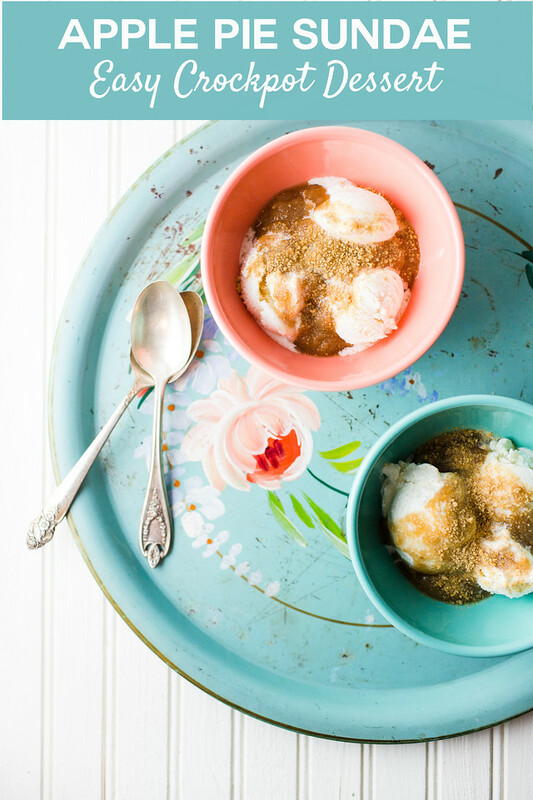 Serve with graham crackers and ice cream in a cute bowl! If you love the idea of fruit topped ice cream – these Triple Raspberry Sundaes are so pretty! This Apple Pie Sundae has all the flavors of an apple pie without all the work! Place the apples and pears in a slow cooker. Nestle in the cinnamon stick, add a pinch of salt, and 1/2 cup of water. Cook on low for 6-8 hours. Smash with a potato masher or immersion blender until it gets the consistency that you like. Place the graham crackers in a ziplock bag and crush with a rolling pin. 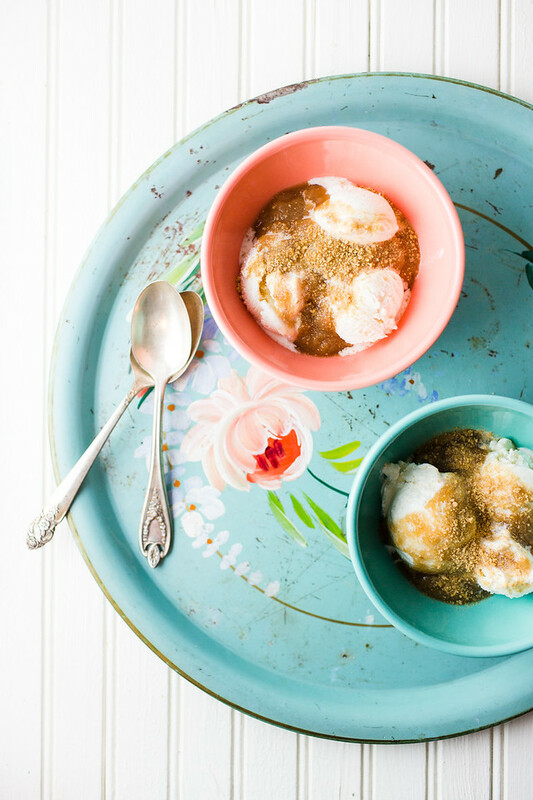 Spoon the ice cream into bowls, top with the warm apple sauce and sprinkle the graham cracker crumbs on top. What a tasty and easy recipe idea! I love it and a great way to integrate summer into fall! I will be pinning your Apple Pie Sundae, it looks awesome! Thanks so much for sharing with us at Full Plate Thursday. Looks like a lovely treat, Pam! Thank you for sharing your Apple ‘Pie Sundae and for being a part of Hearth and Soul. What a terrific dessert. I’ve never tried apples in the slow cooker. Must give it a go. Sounds delicious but I must NOT pin this!! lol!!!!!! What a fun idea! Shared on our Hearth and Soul Hop Facebook page, Pam. Thank you for sharing it with us! Brilliant idea! I usually leave some apple skins in my applesauce, because it comes out pretty pink! I do mine on the stove, because I don’t have a crock pot. This is the perfect Fall treat! Thank you for joining us for the Merry Monday link party! I’ve always wanted to make this applesauce. I like the idea of adding pears. This looks perfectly delicious, and sounds so easy to make! Will be trying this one for sure :). What a nice idea for enjoying apple a la mode but making it a zillion times easier! I buy graham cracker crumbs every couple of years to make key lime pie for my mother-in-law (it’s one of her favorites), but then never know what to do with the rest of the box–this sounds great! The apples might not have been pretty when you purchased them but they’re sure pretty, now! Pretty delicious looking!